By now, I’m sure you have heard of Pokemon Go, the real life scavenger hunt game that you download on your phone and then hunt Pokemon. Our family did some adventuring in Nashville yesterday and learned the basics. My son is also an experienced Pokemon fan who helped Mom and Dad figure out how to play. We headed out as a family and we did see some groups of teens all with phones in hand. Pokemon Go is a great way to get out and get some exercise and explore your area, but be safe. Go hunting in a group and make sure you stay in areas where there are other people. You can walk for miles, depending on where you are, so it might be worth carrying a water bottle and some snacks. Download the app on your phone. Go HERE for iTunes and HERE for Google Play. Sign up using your Google account. The game is WAY more popular than expected and as of this morning I still could not sign up for a Pokemon Trainer Account. To add a child, you have to have an adult Pokemon Trainer account to link a child account to and give permission to that child to play. You can set up a new account HERE when it becomes available again. The first step is to customize your avatar by picking your hair color, eye color, clothing, etc. Once you have that set (and a gamer name), your adventure begins. To learn to play, click the Pokeball in the bottom middle of the screen and then click on “Tips” at the top right. The game will the walk you through the basics including what the different symbols are on the map. *BONUS TIP* This game is a battery hog! But, there are a few things you can do to increase the life of your phone battery. 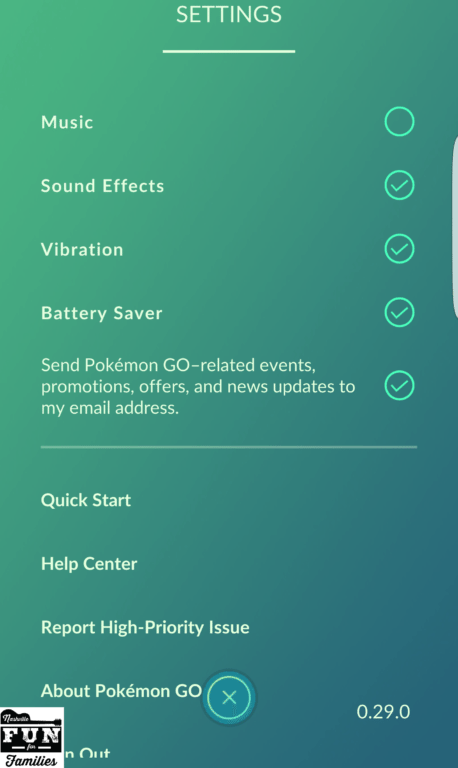 Go into the settings (click the Pokeball at the bottom middle of the screen, then on the next screen Settings is at the top right.) We turned off the music and turned on the battery saving mode and were able to play for 4 hours and still have battery life left. If you are planning a full day of hunting grab an on the go battery charger. 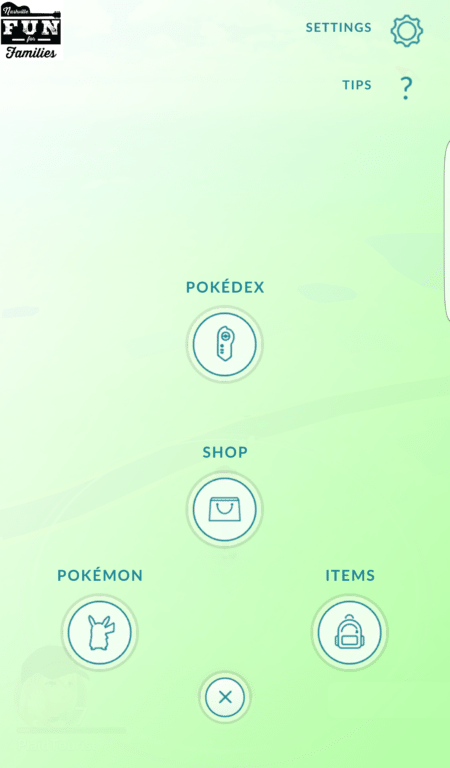 Access the Menu by clicking the Pokeball in the middle of the bottom of the map screen. This takes you to a screen your tools. Shop – Use in game coins to purchase Pokeballs, Incense, Lucky Eggs, Modules, Incubators, and Upgrades. This is also where you can buy Pokecoins with real money. Items – This is your stash of items including Potions, Revive medicines, Incense, etc. Pokemon – This shows all the Pokemon you have caught and then swipe to the left you can see all the eggs that you have collected. Start walking around. We found our first Pokemon in our house and then got in the car to drive around and find more. Make sure you have an adult or kid that you trust as your navigator to direct you. The interface looks like Google Maps without the street names. There is a rectangle on the bottom right corner where Pokemon will pop up if you are close to them. Click on it and there will be small pictures of the Pokemon along with footprints to show you how close you are. 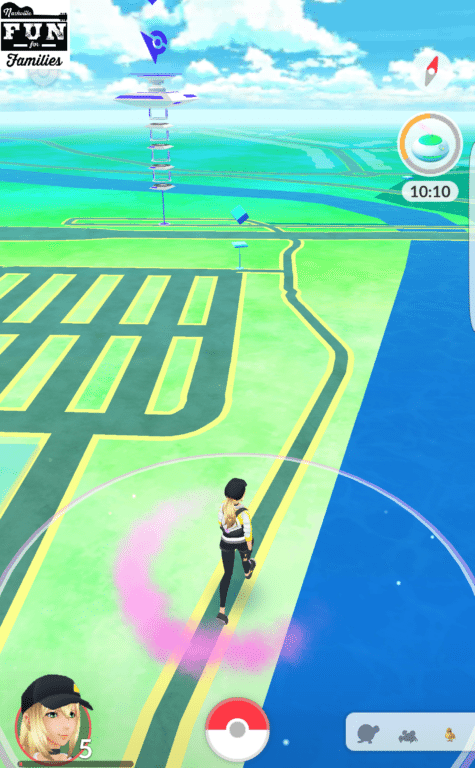 The more footprints, the further away the Pokemon is from your location. Once a Pokemon appears on your map, tap on it and it will open your camera and you can start throwing Pokeballs at it. There are colored circles around the Pokemon that decrease in size and then reset to a big circle and the shrink again. My family have different techniques for catching one. My son puts his finger on the Pokeball and then releases when the circle is small. I’ve been more successful when I release the ball at the big circle. (If you play and know the best way to do this, definitely leave a comment and let us know). Once you hit a Pokemon with a Pokeball you’ve caught it. The ball has to wiggle 3 times and then “Gotcha!”, you captured him! Watch on your map for Pokestops and Gyms too! Pokestops – on the map these look like blue 3D diamonds floating in the air. Pokestops provide you with more Pokeballs, potions, and other tools to capture Pokemon. We’ve noticed in Nashville that almost every church we pasted was a Pokestop. 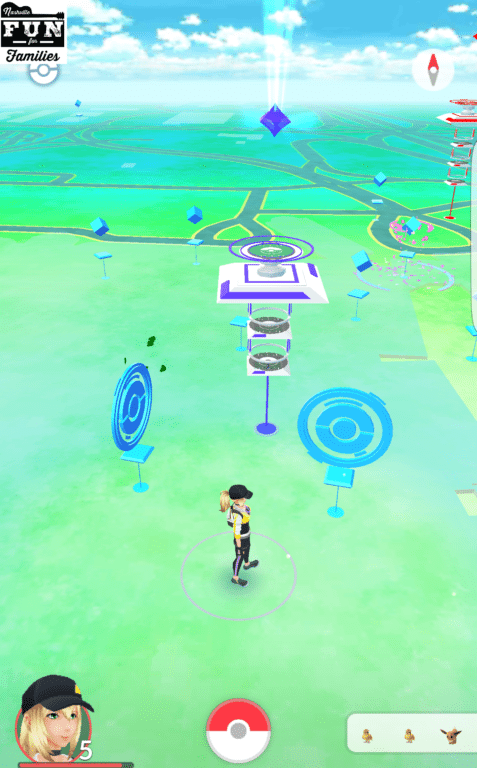 Gyms – These are the big towers on the map. You have to be a Level 5 character to do battle (It took us about an hour of hunting to earn enough points to reach Level 5). Get within range of a Gym and take your top 6 Pokemon into Battle to become the champion. Once you get into the Battle, tap on the enemy Pokemon to attack. Watch the blue rectangles under your Pokemon’s health meter at the top of the screen, when the rectangle is fully blue, hold down on the Pokemon and you will launch a special attack. If you swipe left or right, you can dodge an enemy’s attack. 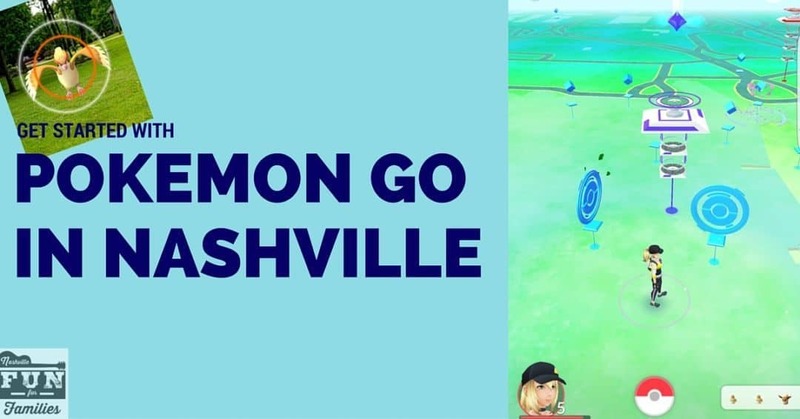 We battled on the Greenbelt in Donelson and then ventured over to the Opry Mills area where there are Pokestops and Gyms all through the Gaylord Opryland Hotel and Opry Mills Mall. I’m sure there are lots of great places to play Pokemon Go all through town – leave us a comment with your favorite area to go hunting! Centennial Park downtown is GREAT for Pokémon hunting! Tons of pokestops, Pokémon, and a few gyms! Added bonus–parking is free! Thanks!! We’ll check it out! I played with my 14 yr old stepson yesterday, downtown. Lots of action there but $18 to park for 4 hours. I live in Donelson area but am new to the area. What and where is “Greenbelt”? Here’s a map to the greenbelt and trails through Nashville: http://greenwaysfornashville.org/interactive-maps/ We found a Pokestop at the corner of the Kohl’s parking lot where there is a trail entrance. The address is 2330 Jackson Downs Blvd, Nashville, TN 37214 so you can Google it. Awesome. Thanks. We will check that out later. First, We are heading for the Parthenon/Centennial park first to check that out. I will be 50 this year, and would probably never do this by myself. But with 14 year old stepson in to it BIG time, it’s kind of fun! I would add to check on your data plan. If you don’t have unlimited data you may be paying a lot to play!